"We are meant to transform cities and nations by our presence and prayer in every realm of our culture.... The Lord is speaking to the Church in this present day to transform these realms of influence with the light of Christ." Takes the kingdom message to NPR's "Fresh Air"
C. Peter Wagner, head of the New Apostolic Reformation, who has been so controversial in the news lately due to his Dominion teachings, was interviewed by Terry Gross on Monday (10-3-11) for National Public Radio's "Fresh Air" program. To read a summary and listen, go to this PAGE. The transcript is available HERE. In this interview it is very clear that Wagner no longer teaches the biblical message of the Gospel of Salvation. In fact, had he truly believed the biblical Gospel, he would have jumped at the opportunity to take the real Gospel of Jesus to this show's vast audience of "unreached people groups" (a goal he once held as a global mission leader). Sadly, he let that priceless opportunity go in order to deliver another message -- that of the 7 mountain kingdom he is now working on building here on earth. His comments reflect the extent to which he has bought into the marketing methodology that a paradigm can be shifted if enough critical mass is reached, especially by putting people of influence (otherwise known as "change agents") into positions of power in society. This is how he intends to build his 7 mountain kingdom, he says. What he doesn't say is that most of his partners in kingdom building have also used extremely strident warfare rhetoric, calling for taking the kingdom by violence. But during the interview Wagner retreats back to the more socially acceptable "kingdom" message. This kingdom gospel is hitched on as a second part of the salvation message. In fact, it has now gained supremacy as the more important message. In this worldview, salvation is only a means to an end. Once people are "saved" (however that is defined), they then become citizens of the new kingdom that is being built on earth. If this sounds a bit like the old Social Gospel message, it is -- but revivified in a new context. GROSS: One of the beliefs that unifies people in the New Apostolic Reformation is a belief in dominion, that God gave humans, through Adam and Eve, the responsibility of dominion. God gave man, quote, "dominion over the fish of the sea, over the foul of the air, and over every living thing that moveth upon the earth." So since you see it as your responsibility of dominion, you've described - people of the New Apostolic Reformation have described this as taking dominion over the, quote, "seven mountains." So this means taking over dominion over business, government, media, arts and entertainment, education, family and religion. How are we to interpret that? What does that mean, taking dominion over these seven areas? WAGNER: Yeah. Well, that's a fair description of where we're coming from, Terry. In terms of taking dominion, we don't - we wouldn't want to - we use the word dominion, but we wouldn't want to say that we have dominion as if we're the owners or we're the rulers of, let's say, the arts and entertainment mountain. GROSS: So you don't believe in the rapture and the tribulations. WAGNER: But I don't - I don't see how it fits now into what God is showing us. That's a good question, incidentally. And so I don't - no, I don't believe in that. But what I believe is that I take very seriously, in the book of Acts, what Peter said. Peter said in a speech recorded in the book of Acts - and I've got my Bible. Let me just read that. It said: God may send Jesus Christ, who was preached to you before - we believe that means that God will send Jesus again - whom heaven must receive, where he is now. Observe that Wagner has placed the current revelation of his apostles and prophets over the Word of God. Elsewhere in the interview Wagner explains their role, and how they have "tremendous authority in the churches of the New Apostolic Reformation" and that they "get a lot of our guidance from God through them." Note the phrase "through them." It isn't coming from the Bible. It is their new words. Wagner's eschatology is also based on marketing's "critical mass" theory -- he believes that when they (his NAR) "restore" this "kingdom" and enforce "his will be done on earth" that then the paradigm will shift. He says "when that happens enough, Jesus will return." This is parallel to the esoteric (New Age) idea that there will be a cosmic spiritual shift where man becomes a co-creator in his own destiny, and a co-redeemer of the planet earth. Elsewhere on this blog we have written extensively about this view. In this eschatology the return of Jesus hinges upon everyone on the planet become aligned to the kingdom shift. The NAR's impotent Jesus is stuck in heaven. He can't act until we reach a planetary "critical mass." Which also accounts for the frenetic prayer warfare activity to try to bring heaven to earth. Biblical Christians need to understand that many of the New Apostolic Reformation (NAR), Emergent Church, Church Growth, Word of Faith and other related movements are operating under a paradigm shift. Because of that when they use the word "kingdom" they do not have the same biblical concept of that word that biblical Christians do. Whether purposely or under the influence of the Zeitgeist, the "new breed" paradigm shifters use the word "kingdom" in order to lure people into their Dominionist/social gospel worldview. They know that most Christians love to hear about the "kingdom" so they act like they are talking to them in the unity of the Faith. But they are not. One argument KN [Kingdom Now] promoters make is that we are to be light and salt, therefore we must populate every aspect of life in order to accomplish KN/Social gospel. They say that Christians must take over every aspect of life ... businesses, government, all leadership positions, etc. But this is not only not taught in the Bible, how to live as light and salt in a fallen world was also practically demonstrated by the first century Church in Rome. Here is an example of how the first century church were being light and salt to their generation. The Romans, during that time, were becoming ever more immoral. Because of the proliferation of prostitution and adultery in Rome, there were a number of unwanted pregnancies. It became a practice for Romans to take their unwanted babies out to the rocks around the city and leave them there to die in the hot sun. What did the first century church in Rome do? Did they go to the authorities and protest? Did they try to get laws passed to forbid this practice? Did they try to get people of the government on their side? Did they try to populate the government with Christians? Did they protest in the streets and form public prayer meetings to "divorce Nero"? Did they make claims that they would rid the land of this practice? Did they try to "overthrow" the government of Rome? No. They simply went out, got the babies off the rocks, took them home, nursed them back to health, and kept them as their own children. 1. 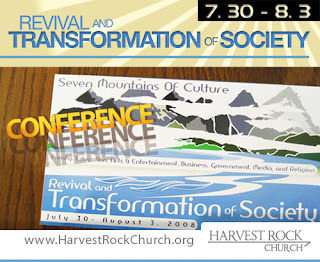 Exhibit 1: http://www.elijahlist.com/words/display_word_pf.html?ID=6479 "Harvest Rock Church -Revival and Transformation of Society – taking the Seven Mountains of Culture," paid advertisement, May 24, 2008. 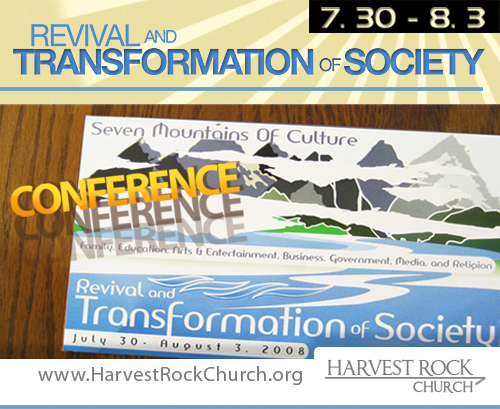 Speakers: Peter Wagner, Cindy Jacobs, Charles Stock, Lance Wallnau, Robert Stearns, Rob Deluca, Paul Tan, Che Ahn. 2. Ibid. Text is from the advertisement. Emphases added.